The Cyto-Genetic Assistant is a semi-automatic tool to classify chromosomes. It includes the detection of telomeres and the matching of pairs of chromosomes. 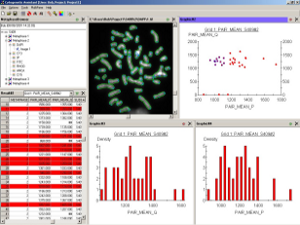 It provides a semi-automatic environment for chromosome classification. Most of the fully automatic systems available on the market are giving good but not perfect results. The product we developed for a specific European customer provides the capability to manually match chromosomes by pair, and to validate any intermediate results of the detection. 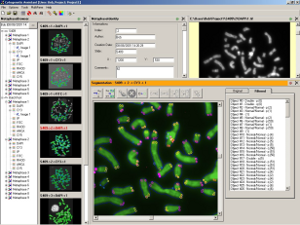 The Graphical User Interface is made of multiple independent windows for each step of the detection and an image gallery showing the chromosome matching. All results are saved in files, and a direct link to a spreadsheet is also available. The software product is a fully stand-alone application developed in Visual Basic, calling for standard and specific Aphelion™ ActiveX controls. It was developed for the "Centre d'Etudes Atomiques" in France by ADCIS engineers.